Growing up in the 70’s in Northern California, Jeff was exposed to many country and southern rock bands of the day, including The Eagles, Lynyrd Skynyrd, The Allman Brothers, Poco, The Flying Burrito Brothers, Molly Hatchet, The Outlaws, and The Charlie Daniels Band. Although these bands were to play a large part in Jeff’s later career, it was the influence of the Progressive Rock bands, Yes, Rush, The Who and Pink Floyd (particularly David Gilmour’s solo in the song “Money”) that initially grabbed Jeff’s attention. Jeff’s musical training began at the tender age of seven with the clarinet, encouraged by his Grandfather who was a huge Benny Goodman fan. Piano lessons followed but didn’t last too long as the “otherworldly” tones of Progressive Rock ushered in his adolescence and led Jeff to his first guitar… a much beloved “Woolworth’s Top 20” purchased on one of Jeff’s summer visits to his mother and younger brother in England. Despite guitar strings the size of telephone wires, and an extremely uncomfortable action that would make a grown man cry, Jeff pursued his newly found instrument with enthusiasm and diligence. Les Paul and Stratocaster copies reinforced Jeff’s arsenal (more on Arsenal later!) and meanwhile Jeff’s talents were being transferred to the stage in various bands doing the usual rounds, playing high school dances, birthday parties and (much to his father’s chagrin) to the neighbours via the garage! 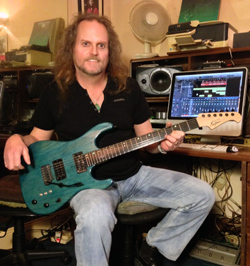 While gaining more and more playing and performing experience around the Sacramento scene, Jeff also completed a music theory degree from Sacramento City College, leading to a successful career in teaching that was to play a bigger role in his life later on. The quieter pursuit of song writing occupied much of Jeff’s time as well, culminating in several recording sessions with his band “Critical Decision” at Moon Studios in Sacramento, which still exists to this day. In November of 1986, Jeff packed up his bags, grabbed his guitar, and headed across the pond to England for an extended stay with his mother and brother who were living there at the time. He soon came under the expert tutorage of Phil Hilborne, noted guitarist/performer/and author of the best selling instructional book, “Solo”. During the summer of ’87 Jeff started auditioning for bands, and in July of that year he took up a full time position as lead guitarist and backing vocalist with North Point Park. The band spent a creative year writing and rehearsing songs, which were eventually to be performed in many of the pubs and clubs across the UK and Europe. During one of their gigs at the celebrated venue “The Mean Fiddler”, the band caught the eye and ear of Helm Management who were keen to put the band into high profile support slots with bands as diverse as, “The Buzzcocks”, “Echo And The Bunnymen”, “The Fixx”, Hazel O’Conner, “Del Amitri”, “Faith No More”, “Blancmange”, Ronny Jordan, “Tony McPhee’s Groundhogs”, and “Screaming Lord Such”. The band continued to tour successfully and in 1991 were commissioned to record an EP with well-known record producer, the late Colin Thurston. Most noted for David Bowie’s “Heroes” album. Between gigs, North Point Park were hold up in The Mill Studio, Berkshire (formerly owned by Led Zeppelin’s Jimmy Page) recording material that continued to attract a dedicated following of fans. Here Jeff had the privilege to meet and work with recording producer John Etchels, who engineered David Gilmour’s solo album. The following year the band embarked on a two-week tour as opening act for Gary Numan in support of support of their newly recorded material, culminating in a performance at Hammersmith Odeon where Jeff had enjoyed performances of many of his childhood heroes. This was to be North Pont Park’s high-point, as within a year the band had succumbed to the age old problems of managerial disputes and artistic differences resulting in a friendly parting of the ways. In January 1997, Jeff was put in touch with the Illegal Eagles who were looking to fill a vacancy in their newly formed band. Coming from California (and a little bit homesick) Jeff jumped at the opportunity to perform some of the most perfectly crafted songs to emanate from the Golden State. Originally hired to play lead guitar and backing vocals, Jeff soon introduced his guitar synthesizer into the mix enabling him to perform parts outside of the original five-piece band. Audiences were treated to the banjo, mandolin, organ, trumpet and strings, and it wasn’t long before Jeff (with his California drawl) was asked to front the band and share lead vocal duties. During this period Jeff continued to pursue his driving passion for writing and composing original music. Drawing from his own diverse musical influences and personal experiences, and collaborating with a few of the UK’s most gifted musicians, Jeff crafted two highly critically acclaimed albums, “Jessica” and “Elder Creek”. Both of which, secured “album of the month” as well as top ten positions as “album of the year in several publications. 2015 sees Jeff working on his next album, looking forward to some live dates this year with his newly acquired JG signature model guitar from Dan at MacPherson Guitars.